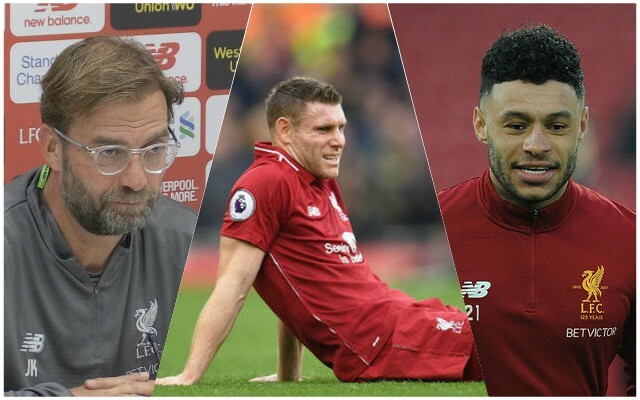 Jurgen Klopp has confirmed that James Milner will miss the clash with Arsenal on Saturday evening with the hamstring issue that kept him out of the Boxing Day match with Newcastle United, but says Alex Oxlade-Chamberlain is edging closer to fitness. Dominic Solanke is also out of the Arsenal game with ‘muscle problems’ although he was never likely to have been involved anyway. Milner is likely to be back for the trip to Manchester City on Thursday night, where his experience could be crucial against his former side. The unexpected update on Oxlade-Chamberlain, who looks more likely to be back by the end of the season after Klopp suggested he could be back in training as early as February, was an excellent surprise revelation. Klopp says Alex Oxlade-Chamberlain could be back in full training in February. "We are very happy about that." It was certainly positive news. To have Chamberlain back before the end of the campaign would be a huge boost, while Milner’s issue is nothing long-term. Most of the other players are fit to start against Arsenal, with Fabinho and Naby Keita amongst those hoping to be recalled to the starting XI. Alberto Moreno is unlikely to be involved after injury and his criticism of Klopp this week.